Synthetic cathinones are derivatives of the naturally occurring compound cathinone, the main psychoactive ingredient in the khat plant Catha edulis. Cathinone is the β-keto analog of amphetamine, and all synthetic cathinones display a β-keto moiety in their structure. Several synthetic cathinones are widely prescribed medications (e.g., bupropion, Wellbutrin®), while others are problematic drugs of abuse (e.g., 4-methylmethcathinone, mephedrone). 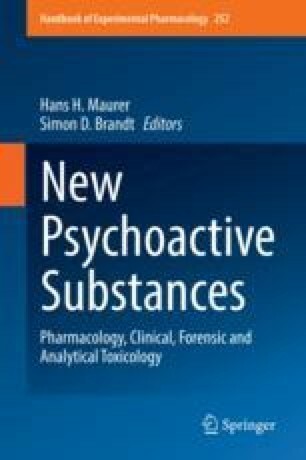 Similar to amphetamines, synthetic cathinones are psychomotor stimulants that exert their effects by impairing the normal function of plasma membrane transporters for dopamine (DAT), norepinephrine (NET), and 5-HT (SERT). Ring-substituted cathinones like mephedrone are transporter substrates that evoke neurotransmitter release by reversing the normal direction of transporter flux (i.e., releasers), whereas pyrrolidine-containing cathinones like 3,4-methylenedioxypyrovalerone (MDPV) are potent transporter inhibitors that block neurotransmitter uptake (i.e., blockers). Regardless of molecular mechanism, all synthetic cathinones increase extracellular monoamine concentrations in the brain, thereby enhancing cell-to-cell monoamine signaling. Here, we briefly review the mechanisms of action, structure-activity relationships, and in vivo pharmacology of synthetic cathinones. Overall, the findings show that certain synthetic cathinones are powerful drugs of abuse that could pose significant risk to users. The research program of Dr. Baumann is generously supported by the Intramural Research Program of the National Institute on Drug Abuse, National Institutes of Health, grant DA00523.